I’m pulling a double shift and covering for Zak on Time Again Radio. I had thought about playing new recordings of old music on his show, but decided instead to play some new-timey on the MIGFS Show and do something different from 11 to 1. 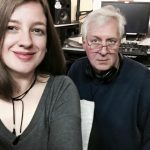 I don’t play enough bluegrass and un-electrified music normally – but tonight you’ll get two hours of great tracks of new artists with that old sound. Enjoy!